There’s nothing quite like zipping through the woods, traversing challenging rocky landscapes, or enjoying the views from a scenic overlook in the Sawtooth Mountains. The trails near Stanley offer some of the best mountain biking in Idaho! The selection of loop courses below feature a variety of difficulty levels and challenges, but all are within a 30-minute radius of Triangle C Cabins! Request a free copy of our Adventure Guide for more ways to explore the Sawtooths on your Central Idaho trip! If you’re looking for an Idaho mountain biking right around the corner from Triangle C Cabins, try the Redfish Lake Loop. Also known as the Grand Mogul Trail, this trail is fantastic for both hiking and biking and features a combination of rocks, smooth singletrack, and narrow ridge riding. It also provides some fun and exciting technical terrain as you ride over the rocks, roots, and small creeks! The technical aspects of The Redfish Lake Loop make this the most difficult course on this list, but bikers with minimal amounts of experience should be able to traverse the trails 13 miles with relative ease. The Williams Creek Trailhead is about 30 minutes south of Stanley off of Highway 75. You can park your car on the small dirt and grass lot off of Highway 75, then get ready to ride the Fisher Creek Loop! This intermediate trail is one of the most popular in the area for its combination of steep climbs and fun descents. You’ll pedal through gorgeous meadows filled with vegetation and seasonal wildflowers with mountain peaks in the distance. As you ride through the pure natural beauty of remote Central Idaho wilderness, you’ll understand why this 17.7-mile journey is one of the best mountain biking trails in Idaho. Leave Triangle C Cabins and Head north on Highway 21 for 10 minutes before taking a left on Stanley Lake Road to get to the Stanley Lake Trailhead. The Elk Meadow Loop branches off near the main parking lot and starts with a climb up a dirt road to some flat singletrack. As you go further, you’ll ride through the dense forest as you hit a few rocky sections. Once you are well into the woods, you’ll gradually go downhill until you are zipping down the fast trail through a clearing. Here, you’ll experience spectacular views of the nature around you. A mix of minimal yet challenging rocks, gorgeous fields, and breathtaking scenery make this a fantastic mountain biking trail in Idaho. Adventure Bundles Make Exploring the Sawtooth’s Easy! Need to rent a bike or get a guide for Idaho mountain biking? We can help! Our “Bike the Sawtooths!” Adventure Bundle has everything you need for the perfect journey through the Central Idaho wilderness. Our Sister Property, Redfish Lake Lodge, also has bike rentals available for guests. While you’re at it, check out the rest of our Adventure Bundles! We offer everything from peak bagging to a sunset appetizer cruise! Forget about extra planning or worrying about all of the little details. We take care of that for you so you can enjoy your time in the Sawtooth Mountains! After a day of mountain biking through Idahos great outdoors, come back and relax in your rental at Triangle C Cabins! Each of our 10 cabins provides guests with a rustic mountain experience that makes for an authentic stay. 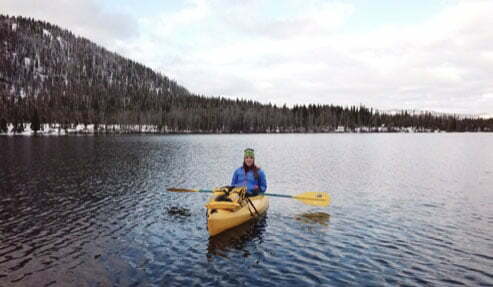 You also get access to all of the great amenities down the road at Redfish Lake Lodge! 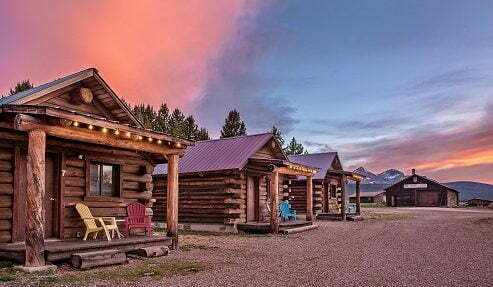 Whether you want to hike your way through Central Idaho or go whitewater rafting on the Salmon River, Triangle C Cabins is the perfect place to experience Idaho at its best! Start planning your vacation by booking your cabin today! If you can’t find availability, check out our Sister Properties at Redfish Riverside Inn, Redfish Lake Lodge, and Stanley High Country Inn for a unique and unforgettable experience! We hope to see you soon at our mountain oasis!